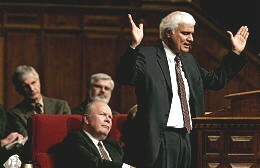 Ravi Zacharias preaches in the Salt Lake Tabernacle as Bob Millet and other LDS authorities look on (11-14-4). Note: Zacharias is quoted as saying that he "will not deal with theology" when he speaks in the Tabernacle on the 14th of Nov. (How can he, in that case, state the differences between Mormonism and Biblical Christianity? That is "theological" matter, is it not?) In my opinion, if he does not state the differences clearly, Mormons will think that he is speaking of "their Jesus" and will be impressed that "someone who is not a Mormon can speak that well about him". Robert Millet (BYU) is quoted saying that Zacharias "did not write that chapter" [chapter on the LDS church in the Kingdom of Cults]. And that he only "lent his name" to that book. Isn't that implying that Zacharias is not, himself, saying that Mormonism is a cult? D.L. Moody did speak in the Tabernacle over 100 years ago, but he did not visit with the First Presidency of the LDS church, because of their huge doctrinal differences. It sounds like Zacharias is speaking to the full houses. If he could make a difference to Mormon audiences on who Jesus is, why are so many Christians insisting on going and taking seats from Mormons? If we believe that Zacharias is able to preach so clearly on Jesus of the Bible that Mormons will see the difference, without even touching theological issues, why don't born-again believers give their seats to Mormons? Articles ...from Deseret News, 11/06/04 attached. QUESTION: Did you read the articles in SL Tribune and Deseret News last Saturday about Ravi Zacharias visit? I think I forwarded them to Dave. I am wondering how is Ravi Zacharias' three day speaking tour in Salt Lake City, including in the LDS tabernacle, financed? Who is paying him? Tickets are free. All arrangements, ushering, music, everything is provided by the LDS church. Could it be that the LDS church is paying him, perhaps through BYU? It was said in the paper that Robert Millet, BYU chair and Greg Johnson (his buddy) have organized and arranged Ravi's visit. I am sure that Ravi's visit will cost a lot of money - to someone. If he is paid by the LDS church, then it explains a lot: of course in that case he is not going to "deal with theological differences" - [sigh] - nor say anything to bite the hand of his Mormon supporters. There goes another one... He is a philosopher - does that now mean double-talker also? I don't mean to be sarcastic, but I am at loss with this. Why do I feel so betrayed as a Christian? Does anyone else feel like that? I was told that Greg Johnson was, a couple of nights ago, on TV channel 20 speaking that we all should unite and not have "denominational differences". Was he saying that the LDS church is another denomination in Christianity? I don't get it. Why is everyone so agreeable with all this - I mean "Millet-Johnson-Standing Together-Ravi Zacharias-LDS church connection"? Someone told me just recently that Johnson has been standing with some other pastors during the LDS Gen. Conferences in front of the temple square and saying to Mormons going there, "I hope you have a good conference". Isn't that like saying people walking off the cliff to their death, "Have a great fall"? What is happening here? I cannot understand this "Standing together" with Mormons! Would someone please explain. We should be nice to Mormons, Krishnas, Hindus or what-have-you, but "standing together" in this context to me means to have theological agreement. Agreement in moral or social issues is not enough. We can "stand together" with atheists or anyone in those matters. I am hoping that someone will enlighten me on this. Understandably, they were trying to contrast some of the more egregious KJV street preacher antics! Unfortunately I think it didn't stop there, but functioned (perhaps unintentionally?) to contrast ALL confrontational ministry. I know for a fact that that's how *some* of the volunteers and *many* of the LDS interpreted it. To be fair, LDS folks misinterpret legitimate confrontational evangelism as well! I think it'd help balance the mess if ST publicly endorsed legitimate street preaching and genuine confrontational evangelism--or even better, publicly denounced the LDS false gospel like Paul did in Galatians 1. Certainly it cannot all be reduced to, "LDS members have a right to attend General Conference without being yelled at." I doubt Mr. Johnson was speaking of denominational unity between the Mormon Church and Christendom. I've talked with him and he seems solid regarding the division between Mormonism and authentic Christianity. His ministry is named "Standing Together" on the premise that Christian churches in Utah should unite "around movements of prayer, service and strategic evangelism." Unfortunately, given the ambiguity of the name and the actions of "Mission Lovingkindness", I don't think many understand that. "Standing Together" sounds like, well, you know. But praise God Ravi is coming. The LDS mean it for evil, but perhaps God sovereignly means this *particularly* for good (Genesis 50:20). If Ravi does not explicitly criticize LDS Church teachings, it will be something to be joyful over if he at least paints a picture of the supremacy of Christ. That's not something LDS folks get non-glibly on Sunday! Just thought I would send a short report on the Ravi Zacharias meeting which was conducted in the Mormon Tabernacle, in SLC, this past Sunday night. No doubt this was an historic event and I am personally glad it is now history. The LDS Tabernacle was packed to overflowing with 6,000+ in attendance. I am guessing that the audience was about 3/4 Christian - 1/4 Mormon. From my personal observations, the meeting was the good, the bad, and the ugly. I cannot honestly say whether I thought it was more bad than good or more good than bad. The Bad... The first half of the meeting my stomach hurt -- it felt like I had swallowed a 1 ton boulder. My daughter Kristin said the first half of the night was just like the end times movies we have all seen where the religions of the world join together to hold hands and pretend that there are not any real issues which should divide us. What Richard Mouw, from Fuller Seminary had to say was way out on the limb. When he stated that Christianity had sinned by demonizing Mormons/Mormonism and we owed the Mormon people an apology... in my opinion he cut the limb off. How can you possibly demonize a false religion which teaches false doctrines and has deceived multitudes of people for decades. In my opinion what he said was irresponsible, he owes many Christians and Christian anti-cult ministries a massive apology for misrepresenting the majority of us. The other thing that sickened me was that every Christian which spoke (except for Ravi) quoted Joseph Smith in a good light. I am not implying that every word uttered by Joseph Smith was blasphemy but why would any Christian want to lend credence to a false prophet. Another thing that really bothered me was when Richard Mouw stated that Christians should join with the LDS people to celebrate the 200 year birthday centennial for Joseph Smith. Why any Christian would want to celebrate the life of a false prophet is way beyond me? The first half of the meeting seemed like a series of serious mistakes to me. Point #1 - The hearts of all men are desperately wicked and full of sin. Ravi pulled no punches here. The BYU faculty seated behind Ravi on the platform showed visible signs of concern on their faces as he waxed eloquent concerning Jesus Christ's teaching about the total depravity of men's hearts. The Ugly... Unfortunately, the benediction went right back to the flavor of the first part of the service when Craig Hazen from Biola University stated in his closing prayer that he hoped each person in the audience would demonstrate the same desire to search for truth that Joseph Smith had demonstrated... (the 1 ton boulder in my stomach that had melted away as Ravi spoke returned with this sickening thought). As I said earlier, in my opinion the evening was good at times... bad at times... and downright ugly at times. This is only my opinion, for what it's worth. So, Mr. Mouw wants us to celebrate the birthday of a known false prophet, false teacher, cultist, occultist, liar, fraud, plagiarizer, and criminal who has deceived and mislead millions of people into a false gospel with doctrines of demons and away from the true, biblical Christ? I'll pass. "And be it remembered that the gods of the creeds, which are the gods of Christendom, are just as false as are the gods of the Assyrians, Babylonians, Muslims, Amorites, Hittites, or any other peoples, excepting only the members of the true church." A New Witness for the Articles of Faith, 1985, p. 543. On behalf of the evangelical community, could Mr. Mouw please ask a Mormon representative to apologize on behalf of the Mormon community for the comments of Mr. McConkie and also the anti-Christian comments made by other Mormon leaders, including Joseph Smith, Brigham Young and John Taylor who have often misrepresented the faith and beliefs of evangelicals? Could Mr. Mouw at least request a retraction from Gordon B. Hinkley that the Mormon church is "the only true church on the face of the earth"? I won't hold my breath. I don't have a major problem with Ravi's comments as quoted in Deseret News. But Richard's comments demonstrate a lack of understanding about the depth of deception in Mormon teachings and doctrines, and of the impact that his comments have on those of us in the trenches. God is sovereign and in control. So, Mr. Mouw's unfortunate comments may be no more than a blip in the work of God amongst the Mormons. But since most Mormons are likely to view Richard Mouw as an actual spokesman for evangelicals, Mormons will think they have additional justification to question our message and motives. If you agree with my assessments, I think it would be a good idea for him to hear from those of us who are able to communicate to him, the potential impact of his comments on our ministries. The professor needs some educatin'. Aaron Shafovaloff, in Ohio, was the first to e-mail me today to ask me what I thought of last night at the Salt Lake Tabernacle. Since then, others have phoned with the same question and others I have encountered out-and-about today. Here's my basic answer to them all, although I can tell you that just about everyone with whom I've talked are all saying the same thing, folks. Ravi did an outstanding job of presenting the Gospel. It occurred to me last night that Ravi, who mentioned The Cross, The Passion of Christ, the Bodily Resurrection, The Holy Trinity and a clear presentation of Who Jesus is, backed by a lot of verses, was speaking across the same pulpit from which Brigham Young would have preached Blood Atonement, Adam-God, Polygamy, etc. What really blessed me was, when Michael Card sang his final song, there were some people lifting their hands in worship in a few spots and some even standing. (The Pentecostal woman behind me was as was the Presbyterian man in front of me). It seemed that the Holy Spirit was very Present at that time. After all, God promises that He will dwell in the praises of His People and I sensed that a spirit of praise went through there at that time, something that has probably never been known in that place. Consider this: Ravi, the first Christian to be allowed to speak in the Tabernacle in 105 years, didn't panic and didn't compromise; he did the best thing he could have done: he preached JESUS! And he couldn't have done a better job. If there was one thing that could have been done differently, perhaps I am selfish for mentioning this, but I wish there had been deaf-interpreting for those of us who are hearing impaired. (I was thankful for the two LDS elders who found me a place right at the front so I could both hear and lip-read). Also, the sound system was not that great; even a lot of hearing people had trouble hearing. I would have offered to have interpreted it into Sign as I have done at other events in years past but my hearing has gotten so bad, I can't hear well enough myself in those situations to do it anymore. Yes, I know that several of you have concerns that the LDS will spin this to their advantage to attempt to appear mainstream and that the LDS person hearing it will think we're all saying the same thing. Well, I knew that there was no way we could stop it from happening so my feeling was to make the most of it, both last night and in the coming weeks/months. I came away with some names and phone numbers. I am already dialoguing with the bishop of my ward. I gave him two tickets for it and he phoned me last Tuesday night to say, "Father, I can't make it because of an awards ceremony I have to go to for my daughter, so would it be all right if I gave the tickets to the Stake President?" I said "sure." We have set up a time to meet to talk soon even though he didn't make it to hear RVI himself. Bob Betts, (whom I've never met), is absolutely right in his take on Richard Mouw. I was there, I heard it and Bill McKeever phoned me later last night to talk about it. I had heard that Fuller Seminary had gone liberal since I first visited there in 1971 but I didn't have reason to think much more about it as I have no contacts with anyone there now. Now that I have heard Richard Mouw speak and say what he did, Fuller will not be a place I can recommend to any of my younger ministers coming up here at Church of the Risen Christ or to our fellow conservative Anglicans with whom we're in fellowship. So, let's get to know those who minister among us, as St. Paul says, and make the most of what took place last night downtown. I was blessed by it, overall, and most I know were too. I saw a lot of Christians there I've known for the past 27 years I've ministered in Utah and the show of unity among so many diverse Christian believers last night was great. And to think it happened on Temple Square blessed me! Now I'll sing Kumbayah and ring off. Having been a Mormon for 40 years, I was so distressed to read the article about you speaking in S. L. and acknowledging them as anything but a cult. Don't you know they believe that all other churches are of the devil and that God was once a man, God has a body of flesh and bones, Jesus was his "literal" son (you figure that one out), Lucifer was another son, that the demons were other sons, that blacks are less "valiant" sons, that whites are "valiant" children, that Jesus therefore is our brother, and that man can become a God. There are so many ministries around the world trying to help people understand the true God. This did not help anyone except the Mormons. As many of you know I attended Ravi Zacharias' speaking engagement at the Mormon Tabernacle last night. I am appalled at what I heard there, as well as how Dr. Zacharias side-stepped two direct questions about Mormonism on Saturday night at the University of Utah. The first question asked there of Dr. Zacharias was what are the differences between Mormonism & Christianity. He sort of replied, with a disclaimer. He said "I have to keep in mind that I am a guest here". He then went on to "answer" that question, but failed to explain what the differences are and how significant they are for a person's salvation. Last night Greg Johnson, Standing Together Ministries, (main catalyst in organizing Dr. Zacharias' visit) introduced the Evangelical Christian leaders in attendance at the Tabernacle, sitting on the main stage. He gave a special honor to Craig Blomberg from Denver Seminary, saying that his book (with BYU's Steven Robinson), How Great the Divide was instrumental in getting the ball rolling in getting evangelicals and Mormons together. The next person who came to the podium was Dr. Robert Millet, a religion professor from Brigham Young University. He talked about D.L. Moody's visit to Salt Lake City over 100 years ago. He basically was comparing this evening to that visit. He then went on to say that "God is our father and loves us all." That sounds great but we need to look at who Mormons think God is. The God of Mormonism was once a man and had to progress to Godhood. He is one of many Gods and they teach that he is our literal Father in Heaven because we were born to him and his wives on another planet as spirit children before we came to earth. That is not what the Bible teaches. We are made in the image of God, which image is not a physical, but a spiritual, for God is Spirit. We are not children of God until we accept His free gift of salvation through His Son, Jesus Christ of the Bible. John 1:12 says it clearly, "But as many as received Him, to them He gave the right to become children of God, to those who believe in His name." Dr. Millet went on to say that "this is not a broad ecumenical movement and that we can't browbeat one another with the facts." If we can't use facts how can we reason with each other? Dr. Millet said that "God cares more about people than truth." I almost fell out of the pew I was sitting in when I heard that. Dr. Zacharias was supposedly going to talk about absolute truth. My question now is, how can we discount truth? Jesus Christ is the truth, and thus we can't say or think that God does not care about what the truth is. Once again if we discard truth and facts we are relying solely on feelings. The Bible says that we cannot trust our feelings, or our heart. Jeremiah 17:9 declares, "The heart is deceitful above all things, and desperately wicked: Who can know it?" Dr. Millet then quoted Joseph Smith as saying that "truth will cut its own way." What was he saying? Greg Johnson said that he had asked the President of the Mormon church, Gordon B. Hinckley, why he "allowed" the evangelicals to use the Tabernacle. He quoted President Hinckley as saying, "Well is sounded like a good idea, and we were glad to help." I am sure that Hinckley thought it was a good idea because by Dr. Zacharias coming to speak there gives validity to the Mormons as Christians. No one during the entire time spoke of the major differences between Mormonism & Christianity. When Dr. Zacharias came to the podium he agreed that there were differences between LDS and Christianity, but yet he didn't say what those differences are. Dr. Zacharias said that "We know little about Jesus." I was surprised by this statement because the Bible tells us so much about Jesus, who He is - and is not. Dr. Zacharias spoke of the exclusivity of Jesus and said that "Truth is exclusive". He quoted from Mark 4, and stated "the mystery of Jesus is the mystery of divine personality." I am not sure what Dr. Zacharias meant by this. He then started his sermon , "What made Him (Jesus) unique." He said, "description of the human condition [which] confirms to reality as we know it. The heart is wicked." He then spoke from Matthew 15 about a condition of our sinful heart. He told a joke about how we try to compare our own sinful condition to someone else's worse condition and rationalize our own. In my opinion, this joke was not a good one to be told to a Mormon audience, because the pastor in this joke received a hefty sum of money for preaching at this funeral. As you may know, Mormons look down on a paid ministry, on pastors receiving money or financial support for their work as ministers. The Mormon church has taught that receiving money for preaching proves that they are in the employment of Satan himself. This may sound "nick picky" on Dr. Zacharias' words, but we have to look at this from an average Mormon's perspective. He said that Jesus provides mediation for us through the cross and crucifixion. He talked about Matthew 16:13-20, where Jesus asked Peter, "Who do men say that I, the Son of man, am?" Jesus asked also, "Who do you say that I am?" Yet Dr. Zacharias failed to explain who Jesus of the Bible truly is, compared to the Jesus of Mormonism. Dr. Zacharias said that that "Jesus provides History". He did not explain much about this topic. Dr. Zacharias said that "Jesus is the Disclosure of Reality." He said, "We gain unity in diversity." He also said "God in the beginning is as relationship." The way he said (it seemed to me, but I may be wrong), that it may cause an average Mormon to think that he agreed with Mormonism that that God has not always existed as God. Dr. Zacharias stated that "Christ is the embodiment of the Idea." Then he talked about the book, "The DeVinci Code". It could have been an opportunity for Dr. Zacharias to expound on the claims of the Mormon Church that Jesus was married, and had several wives and that he had children, because, as you may know, "The De Vinci Code" presents Jesus as having a sexual relationship with Mary Magdalene and having a child by her. But he did not make "a Mormon-connection" in this matter either. He then continued to speak of Rev. 5. After that Dr. Zacharias spoke of "Jesus' the triumph over the grave." He spoke of John 20, and said that Jesus knows your name. He also used the term our "Heavenly Father". As many know, the Mormon Church speaks of God as our Heavenly Father, because they teach that God is our literal Father, and that all humans are children of God and his wives, from the pre-existence. I felt that when he used the term, "Heavenly Father", it further solidified to the average Mormon that there are no differences between Christianity and Mormonism. [Note from editor: The following is actually referring to Craig Hazen, who is in charge of the M.A. program in apologetics at Biola.] Alan Hultberg, an assistant Professor of Bible Exposition at Biola University's Talbot School of Theology, in his closing prayer, also quoted Joseph Smith, saying that if we, as Joseph Smith, seek wisdom, we must ask God in prayer. Mr. Hultberg prayed that we too must ask God for wisdom. When I heard the name "Joseph Smith" I raised my head and opened my eyes in disbelief. This was playing into the hands of the Mormon Church. This is exactly what the Mormon Church teaches its investigators or skeptics alike to do: to pray to God and ask wisdom to know if Joseph Smith was a true prophet of God, and if the Book of Mormon is true, and if the Church of Jesus Christ of Latter Day Saints is the one true Church. However, we are not to pray about something that God has already spoken about in his Word the Bible. He tells us in Deuteronomy 13:1-5 & 18:20-22 how we are to test someone who claims to be a prophet. God does not ask us to pray about it and go on our feelings. If we test Joseph Smith by God's Word, (I will not go into those false prophecies here) we come to the conclusion that he was a false prophet because his prophecies did not, nor cannot come true - and he led his followers after other gods. Once we have established Joseph Smith as a false prophet, we cannot believe his stories or the Book of Mormon, and his other scriptures, nor can we have anything to do with a Church he established. In my humble opinion this prayer was one of the most damaging things last night, along with Mr. Mouw's apology. In conclusion I'd like to say that Dr. Zacharias' sermon would have been a great sermon if it was given in any evangelical church. However, this sermon, and accompanied other short speeches and prayers, were given in Salt Lake City, Utah, in the Historic Mormon Tabernacle, where the truth about Jesus and His Word and gospel is not heard - or understood by Mormons without clarification. If we don't have a doctrinal common ground with Mormons, we do not have a common ground. I will leave you with this analogy (as many of you who know me, know I love analogies) about what happened last night: It was the same to me as if I was talking with an English man about football and what a wonderful, exciting sport it is, and how said he loves the sport; yet we never clarified that he was talking about soccer, and I was talking about American football. We could not understand each other. It's like apples and oranges. Not the same. I hope everyone who reads this will pray for those who are diligently witnessing to Mormons and to the truth of the Biblical God, Jesus & salvation. I am afraid last night did much damage to those ministries. I'd like to hear a tape or see a video of Mr. Mouw making his apology. I think it would be a good idea for us to contact him and ask him what he has done to the Mormons that warranted his apology. If he has done nothing that he needs to apologize for (has he done any kind of outreach to Mormons prior to this? ), then who is he apologizing for and who gave him the authority to speak for those of us in the ministry to Mormons? Ironically, his apology to the Mormons has put him in the situation where he needs to apologize to those of us who conduct our ministry in a God-honoring manner. A friend forwarded me the article from Deseret Morning News today. Interesting article. Blaine & I would like your comments on the program. I presume you went. Have you all seen the Deseret News of 11/15/04 and our friend Greg Cantrell's written eyewitness report of the events this weekend in SLC? If not, just ask and I will forward tem to you immediately. I received this letter, below, today. It is very interesting. Professor Hazen praised this Sunday meeting, but also acknowledged that "rank and file LDS would not have found anything controversial in it" -in other words, they took it as same as their doctrine. [Sigh] So he is saying that it was good thing that to Mormons Ravi's Christian dogma was not noticeable, or that much different than their LDS doctrine! It spelled "success" for Ravi and Co.? "Next year in the Conference Center" that seats 21 thousand, instead of mere seven thousand! And what is the most important: They did not offend their hosts (the GA's of the Mormon Church) by pointing out doctrinal differences! And they (evangelicals) seem to think that this is all fine and well. The Truth does not seem to matter as long as everyone is happy and friendly. Truth and salvation of the Mormons has to be put on the back burner and is NOT that important as long as they all are "standing together" with them - while they walk straight to hell. Being "friends" is what seems to be important. It is important to be nice and friendly, but I can assure you that it is not love nor friendship if we fail to declare the whole truth about God, Jesus and salvation. We do not know how long each person has before they face eternity. I know, I know, I may sound sarcastic and even a bit angry - but that's the truth! (Did you see on TV faces of Mormon leaders on stand Sunday night? They were HAPPY, HAPPY - this means victory to them, they seemed to say that they are accepted among Christians - and soon perhaps to the very "mainstream! What is the difference?, they may ask. "Divide wass not great, and now it hardly exists.) And Christian leaders apologize to Mormons for bothering them with the truth about Jesus! WOW!!! Below is a letter from Craig Hazen from Biola. Read and wonder! Does it cause any sadness in your soul? This guy, as well as Richard Mouw from the Fuller Seminary, are religion professors! No wonder BYU's religion professors, like Steven Robinson and Robert Millet, can hood-wink them all! Barna report says that only about 23-51% of SENIOR PASTORS in USA believe the Bible... (Highest, 51 % are Baptists, but that still makes half of even their senior pastors just non-biblical pretenders or hypocrites, not a lot to be happy and proud of.) Where then can their congregations be doctrinally? Not even close! No wonder cults flourish! And Mormonism especially! Lord must be coming sooner than we have thought! Those of us who were ministering in Mormon country last weekend are indescribably grateful for your prayers. I believe there was a spiritual earthquake on Sunday evening (November 14, 2004) in the LDS Temple Square and we will be feeling the aftershocks for many months if not years. There were 7,000 tickets distributed for this event and every seat was filled. Many who came hoping to get into the Tabernacle or the overflow center were disappointed to have to be turned away. The event was covered by all of the print, radio, and television media in Salt Lake City and beyond. Although the LDS prophet/president was not in attendance (at 94 he is not able to attend many events), there was top level LDS leadership in the hall as well as the senior religion faculty from Brigham Young University. Mormons and Evangelicals from all over Utah packed the venue. Many I talked to had flown in from other parts of the country for this historic event. Michael Card, the Christian singer who performed five songs in the course of the evening. After some introductory remarks from both the Mormon and Evangelical sides of the aisle, Michael Card led us all in some amazing worship songs. It was surreal to see Evangelicals worshiping in Spirit and Truth at the center of Mormon power and influence. It was a tremendous reminder that the Triune God of Scripture will ultimately triumph and that one day every knee will bow and every tongue confess that Jesus Christ is Lord. Ravi Zacharias gave a dazzling message focusing on the person and work of Christ. I think it was the most effective thing he could have done. In my view the rank-and-file Mormons would not have found anything controversial in it. However, those LDS who had a more finely-tuned sense of theology (very rare among Mormons, even in their leadership) would have recognized some pointed challenges on sin, salvation, the nature of God, and the state of the human heart. Almost everyone in the audience clapped even when Ravi mentioned the Trinity--except for the BYU professors who knew it was not in concert with LDS teaching and sat more stoically at that point. Nevertheless, Ravi received a long standing ovation from every person in attendance when he concluded. I was the final speaker and took the opportunity to challenge the Mormon leaders to make this an annual event. I actually got a huge laugh when I turned to them on the platform and asked "Don't you all have a bigger place right across the street for next year?" (I was referring to their 21,000 seat Conference Center.) The newspapers picked up on that and mentioned this humorous challenge. The word on the street in Salt Lake City is that the wheels might already be turning for such a follow-up event. I have little doubt that this will be an event featured prominently in history books 100 years from now. It would take me hours to type out the fuller picture of what took place. It was truly extraordinary. I am so grateful for your prayer partnership in this effort. And I am so thankful to our faithful God and King who listens to our prayers and who longs for all to come to a saving knowledge of His Son. I'd be honored if you'd continue to pray as I head off to San Antonio tomorrow to speak and to meet with another group of Mormon scholars and leaders. "The Ugly... Unfortunately, the benediction went right back to the flavor of the first part of the service when Craig Hazen from Biola University stated in his closing prayer that he hoped each person in the audience would demonstrate the same desire to search for truth that Joseph Smith had demonstrated... (the 1 ton boulder in my stomach that had melted away as Ravi spoke returned with this sickening thought)." Thanks for your report on the Tabernacle event. However, I know you will want to be accurate with regard to what I said in prayer while closing the evening. You misrepresented my statement and I know you'll want to make it right with everyone to whom you disseminated it. I have been reading your mischaracterization in many different venues. I'm not to thrilled to be lumped in with Richard Mouw. He will have to answer for his own statements--quite a task indeed. However, I had written my prayer out and read it so I know exactly what I said. I shall reproduce it here for you so that you can send it out with whatever comments will make this right for all your recipients. Thanks for your concern for the truth--even about the event on Sunday. Solomon asked for wisdom and you gave in abundance. Your servant James taught us that God will give wisdom generously to all who ask Him for this precious gift. Even the Mormon Scriptures say that Joseph Smith, Jr. sought wisdom at a crucial time in his life. No one in this room should ever fear asking You, oh gracious Father, for wisdom. So in a common voice we ask you to give us divine wisdom and the truth about You, about Your Son, about Your Holy Word, and about Salvation. You have promised to answer such heartfelt prayers, and I ask that You would not let a single person leave this great hall tonight without the light of truth being kindled in his or her soul. In the name of the Blessed One, in the name of the Risen One, in the name of the Lamb of God, Jesus Christ our Lord. Amen. Hi Rob, We wanted to thank you again for a wonderful time in Salt Lake. It is always such a blessing spending time with you! I am saddened to hear Michael Card's comments concerning his desire to integrate doctrines together, even potentially at the expense of truth. [Cf. this Deseret News article] We've appreciated Michael Card's music ministry for years, & the Lord has used his music to bless us since we were young Christians. I am concerned, however, when we elevate "human relationship" to a point that treads upon, or does violence to the truth. All unity should be in celebration of the truth, not in spite of it! What true Christian fellowship can there be, with darkness? It is totally right to love the LDS people; do we love them enough to tell them the truth!? (If I possess the cure for cancer, do I show love to the person riddledwith the disease, by watering down their medicine?) Prov. 27:5 says: Better is an open rebuke, than hidden love. Also, while I really enjoyed alot of what Ravi had to say, I believe it was inappropriate for evangelical leaders to refer to Joseph Smith in a somewhat positive light. One should not lend credibility to a false prophet! Anyway, just a few thoughts to bounce off of you, Rob. Again, thanks for everything, it was an awesome time, & we wouldn't have missed it for the world! The best part, as always, was hanging out with you! We love ya ALOT, keep contending for the truth, as it's the truth that sets people free, & take care! P.S. The highlight of the weekend I believe, was your question to Ravi, & his response! It was the "million-dollar" question! After 15 years in the Mormon church and 24 years ministering to the Mormons, I can only weep with Rauni about this victory for the LDS church. And then to want to make it an annual event? Mormons, but the rank and file are screaming among themselves, "SEE WE ARE CHRISTIANS". As A Mormon, I attended Billy Graham conferences and thought they were wonderful. Except for the altar call at the end, it all seemed to be right on. Enough has been said about the apologies to the Mormons and celebrating Smiths' birthday, that I will not comment. It is already obvious that the Mormon PR machine is going to focus on this. This will also bring joy to the liberal "pastors" around the country who have been shouting let's just love each other, after all doctrine divides. I still love Ravi, but think he has made a terrible mistake. However, the loyal will be flooding him with praise for his great effort, and more such travesties will follow. Our ministries has seen hundreds of Mormons come to Christ thorughout the years, and evryone of them had to see some of the errors of the LDS doctrine before they came to Christ. I wonder how many Mormons will flood the Christian churches around the world after this presentation beggin to accept Christ? With all due respect to Ravi, we will continue to witness to Mormons in the old fashion "one on one" way. Being a Berean (Acts 17:11) is not easy. By taking a stand for truth, more often than not, comes with the cost, even high cost. However, the Lord, WHO IS THE TRUTH, to whom we claim to belong and serve, requires that we stand for Him, no matter what the cost. The Lord says (Rev. 3:15-16) that He wishes that we'd be hot or cold, rather than lookwarm, which I read to mean that we must not be "wishy-washy" with a "phony love" that is not strong enough to take a risk and clearly declare the truth to those who have been misled. The Lord says that those who are only lookwarm towards His gospel, He will spew out of His mouth. Christ brings division. Matt. 10:34-39 tells us that. We cannot compromise. Truth is truth. Unity without agreeing in doctrine is unity with the world. We are told not to be pleasers of men, which is the world, but to be separate. ( 2 Cor. 6:17). You all know that I am not suggesting that in order to be heard we yell and scream or insult anyone. I mean that real godly love towards the lost is tough enough to tell them exactly how and where their eternity will be, unless they humble themselves before the true God, Who is the Author and Finisher of our salvation. We cannot waste time in lengthy "friendship building"-projects before we say much about the error, in this case, error of Mormonism, for we don't know when their appointment with God comes - it could be today, it could be tomorrow. I imagine that these Mormons, when they, in one future day, face reality before the White Throne Judgment seat of Christ, accuse us for not loving them enough to tell them the truth so clearly that they could have understood! I don't think that the damage done this weekend was done by Ravi Zacharias himself, but by liberal theologians, Richard Mouw and Craig Hazen, whom (I assume) Greg Johnson and Robert Millet had chosen to speak and represent Christianity, that is all of us! It is not that Ravi Zacharias did not give a good sermon. I hope you understand what I am trying to say. It was a good sermon to a Christian audience, but he knew he was not speaking just to the Christians - after all he was in a historic Mormon building, with many Mormon leaders present. Ravi failed to declare the truth clearly to those who interpret the words, familiar to Christians, totally differently. I think this is why Biola's Craig Hazen, after the meeting, had said that "rank and file Mormons would not have found anything controversial in it", meaning that what Ravi said would not have alarmed them to see that Mormonism is false! All Mormons in the audience could have agreed with just about everything he said, but yet not understood at all. I think how I, I if I was still an active and believing Mormon as I once was, would have "understood" Ravi's words. I would have interpreted them, based on what I believed as a Mormon, and what I was taught by the LDS church. When he said "Jesus", I would have thought of Him as my brother I lived with in heaven before coming to this world. When he said " God, or Heavenly Father", I would have thought my literal heavenly parents, father and mother in heaven. When he said "redemption" or "payment for our sins", I would have thought of conditional salvation Jesus provided for me, and that I must work hard, along with my husband, to earn my real salvation which is exaltation and godhood. When he said "Trinity", I would have thought of three Gods for this earth, "Trinity" in a sense of unity in purpose among them, - and I would have, at least in passing, thought that someday my husband and I will be as God is now. When he said "Cross" I would have acknowledged and agreed that Jesus died on the cross, but I also would have thought that He had, before going to the cross, already made an atonement for me and provided resurrection by suffering in the Garden of Gethsemane. Like two Mormons on the platform..., I too could have said that I agreed with Ravi's message even when using my "Mormon-mindset". As I may have mentioned before, I personally know active, temple-going Mormons here who regularly listen to Christian speakers in radio and TV, read C.S. Lewis's books etc., and "agree" with them all - even though with some pity that these great Christian speakers cannot go to celestial kingdom because they have not received the "fullness of the LDS gospel". Mormons simply interpret and understand the words used differently.I am sure you get my point. In order to give them a chance to accept the truth found in the Bible and be saved, we need to get into the hearts and minds of indoctrinated Mormons in order to effectively communicate the truth of completed salvation by grace, given as the gift of the real God and Jesus whom He has sent. They must know Who God is, Who Jesus is, before that can happen. To know God and Jesus is equal to salvation (John 17:3), just any god or any "Jesus" will not do. Even if Ravi did not dare to speak clearly to the Mormon audience in the Tabernacle, he failed Saturday night. Then he was "on a neutral ground", at the University of Utah, not LDS turf! He failed to "give an answer to everyone who asks you a reason of the hope that is in you". (1 Peter 3:15 ) He was asked what are the differences between Mormonism and Christianity - he side-stepped that when he replied that he had to remember that he was a guest here! Mormon gospel is another gospel that brings God's curse to those who preach it and/or follow it. (Gal. 1:8-9; 2 Cor. 11:4, 13-15.) We must declare what the true Gospel is - and is not, we must stand for God, even if it means standing alone. May God help us to be lovingly bold. I heard you were at the Friendship and unity conference. What did you think? Hazen and Mouw are tratiors and collabators of the Faith once and for all given to the saints. This type conference is becoming a norm. Use a good guy (Ravi) to bring legitmacy to the event and then lie to the Mormons that we have sinned against them. We have sinned against the Mormons for telling them the Truth! I understand that Ravi did a good job of a theological presentation to the audience. Did he point out the difference between the two Jesus[es]? Did he define his terms to explain what he was saying and what he meant by terms like grace, Jesus, etc.? Also, did he correct Hazen and Mouw publicly and to their faces like Paul did to Peter in Acts 17? Or did he let their lies stink up the joint and settle into the minds of the Mormons and leave them worse off then before. In other words giving them the out that they were looking for. I see so much of this thing now and I see the apsotasy gowing. This type of event just adds confusion to the mix. When jehosophat rides in the chariot with Abah the people become confused. When the good guys go in with the bad it leaves the people confused. I see around the world YWAM telling muslims to go back into the mosques and do their prayers, Hindus to go to the temple and pray there. What happened to "come out of her (Babylon) my people?" Do you think Ravi has to answer for not correct[ing] these men publicly, telling them what they said is sinful and wrong? I understand Paul found common ground but after that he destroy their arguements and error and put forth Truth. I discussed this with RAvi two years ago about how he goes on TBN with the false prophets in direct opposition to 2 John. He replied that he set up his ministry to not name names of false prophets but to just teach postivetly. He does not point out who is in error. Don't the scriptures teach to "mark these men?" Didn't Jesus, Jerminah, John, Paul, and Peter all point out the false prophets and name names? When did we quit doing this? Is it because we are more civizlized now? I have seen you, Chip and Bill point out the error of not only Mormons on the street in Manti but when a Christian speaks in error they are corrected. So why not here? I don't get the double standard where Ravi gets a pass for violating 2 John, marking these men, not correcting bad doctrine taught publicly corrected publicly. I would appreicate your thoughts? I too, agree with Rauni's response. I was also disappointed in Craig Hazen, the professor from Biola. I spent some time with Dr. Hazen at a conference at Biola last year, talking about Mormonism and our ministry to them. He was in agreement with what we discussed and even suggested that maybe I should come out to teach one of the classes in World Religions. He either was not being truthful, or has changed his mind or was being a follower and not a leader in proclaiming the Lordship of our Savior, Jesus Christ. I was extremely disappointed in Dr. Mouw, President of Fuller Seminary. Although he said he was speaking on behalf of the evangelical community, I can assure you he was not! He was not speaking for me nor any of the over 8,000 families we represent. It's hard for me to believe that the Board of Trustees at Fuller would agree with him either and should seriously consider questioning why a man in his position should be trusted in his job. To suggest that we should join in the celebration of Joseph Smith's birthday is one of the most irresponsible things he could have said. If he is so taken with Smith, maybe he should apply for a job at BYU. Finally, I was concerned about Ravi Zacharias' talk. Not that he didn't preach the gospel, but that he had an opportunity to point out that the Jesus of Mormonism is not the Jesus Christ of the Bible. He said "he had to remember who his host was." If that caused him not to preach the truth, then he shouldn't have accepted the appointment to preach in the Mormon assembly. Matthew says when we find things done in secret, we are to stand on the rooftops and shout it out. Ravi didn't do it! I'm not too concerned that this event is going to do too much damage to our ministries to the Mormons. What I'm concerned about is how the Mormons walked away from this saying that they now have proof that they are accepted by the Christian community as Christians. What they really heard was a Christian message. What they didn't hear was the truth that there is a vast difference between Mormonism and Christianity. Lord, we pray that the Mormon eyes would be opened to the truth and that, we as Christians, would not be ashamed to proclaim it. I am pasting below the text of my actual comments at the Tabernacle event. The critical concerns raised are threefold, and I will offer at least an attempt at clarification regarding each: Some of this will be a repeat of specific things I have already written to some of you. First, some folks have asked who the "we" is that I apologized on behalf of when I said that that "we" evangelicals have sinned against Mormons by bearing false witness against them. I certainly did not mean to imply that every evangelical has sinned in this regard. Suppose I were to address an African-American gathering and say that we whites have sinned against you blacks. Who would deny that this is a correct assessment? But who would think that I was speaking about and on behalf of all white people? There is no question in my mind that there has been a discernible pattern of sinning against LDS folks in this regard. I could show, for example, how Walter Martin oversimplified Mormon teachings in his much-read books. But here is an obvious example of more recent vintage: when Dave Hunt writes a whole book whose main thesis is that Mormonism is Satanic in its inspiration and practice, I think this is bearing false witness. On a more technical point, I have received emails in the past few days where evangelicals have said that Mormonism teaches that God was once a human being like us, and we can become gods just like God now is. Mormon leaders have specifically stated that such a teaching, while stated by past leaders, is something they don't understand and has no functioning place in presentday Mormon doctrine. Bob Millet has made the same point to many of us, and Stephen Robinson insisted, in the book he co-authored with Craig Blomberg, that this is not an official Mormon teaching, even though it can be found in non-canonical Mormon writings. The Ostlings, in their book on Mormonism, reported that Mormon leaders insist that the idea that God is omnipotent, omniscience-and much unlike what we are or could ever be-is more accurate than the simple notion that we are all becoming gods like God the Father is. A number of LDS writers have been formulating the "becoming God" theme in terms that are common in Eastern Orthodoxy: that "we shall be like Him" in the sense of I John, but that we will never be Him. Another point: I have been told by many evangelicals that Mormons believe that the atoning work of Jesus Christ was accomplished in Golgotha and not at Calvary. Bob Millet has demonstrated from Mormon writings this this is not true-if the Cross had not occurred, he says, we could not be saved. Here, for example, is how the LDS writer Glenn Pearson described the requirements for salvation in a popular Mormon book of the 1960s: "There has to be down payment of a broken heart and a contrite spirit. Who has a broken heart and contrite spirit? One who is stripped of pride and selfishness. One who has come down in the depths of humility and prostrated himself before the Lord in mighty prayer and supplication. He has realized the awful guilt of his sins and has pled for the blood of Christ to be made a covering to shield him from the face of a just God. Such a one has made the down payment." In none of this am I saying that Mormons are "orthodox Christians." But I do believe that there are elements in Mormon thought that if emphasized, while de-emphasizing other element, could constitute a message within Mormonism of salvation by grace alone through the blood of Jesus Christ. I will work to promote that cause. Most of you will disagree with that approach. But at the very least admit that we have not always been fair in our wholesale condemnation of Mormonism as simply a false religion. Second, some folks are upset about what they took as a call from me for evangelicals to join in the celebrations of the bicentennial of Joseph Smith's birth. I can see how people heard me say that we evangelicals should join in "celebrating" Joseph Smith's birthday, but that is not what I intended to say. Instead I said that I hoped that many evangelicals would participate in those events that would allow us all to "pay special attention to Joseph's life and teachings" during this year. I was thinking and speaking too much as an academic on this one, and I know that doing so created unnecessary confusion. For example, I am going to take part in a special conference at the Library of Conference, where I will respond to an LDS scholar's views on the contribution of Joseph's theology. Those are the kinds of events where there can be critical give and take, and I see this bicentennial year as a time when we evangelicals can try to sort out the good from the bad in Joseph's thought. There are some of his writings, for example, that sound quite orthodox, and others--such as the King Follett Discourse--that have views that are far removed from anything in the Christian traditon. But ordinary evangelicals do not have opportunities to engage in those kinds of serious theological panels--thus I was talking too much as an elitist! At the same time, I would think this would be a wonderful opportunity to put on some events in Utah, perhaps in cooperation with local LDS folks, where people talk together about some basic themes in Joseph's thought. In our quiet dialogues, for example, we--evangelicals and LDS together--find many of his earliest statements to come close to a traditional Reformation (and Epistle to the Romans!) emphasis on salvation by grace alone, the unique substitutionary work of Christ on the Cross (and not just in Golgotha) and so on. The statements from D&C that I quoted, for example, sound straight out of an evangelical sermon. My own view is that instead of arguing primarily about the things we find offensive in Mormonism, it would be good to spend some time reflecting together about what we mean when we both say that Jesus alone saves, and that he paid the debt for our sin on Calvary. For the record: I do not believe Joseph Smith was a true prophet of God; I do not accept the Book of Mormon as a legitimate revelation; I do not believe that temple baptism saves; I do not believe that all people will be saved. And it is precisely because of this that when my good friend Bob Millet says that his only plea when he gets to heaven is "the mercy and merit of Jesus Christ," I want to respond by saying with enthusiasm, "Let's keep talking!" I hope this helps a little. I am deeply sorry for causing distress in the evangelical community. I make no apology for wanting to foster gentle and reverent dialogue with Mormon friends. But I want people to be upset with me only about things I really meant to say--and I failed on this occasion, on one important point, to make my case clearly enough. Blessings! It is difficult for me to find adequate words to express how thrilled I am to be here this evening. Here we are, evangelical Protestants and members of the Church of Jesus Christ of Latter-day Saints, gathered together in this Salt Lake Tabernacle, for an event that is described as "An Evening of Friendship." I am not being melodramatic when I say that this is surely an historic occasion. To be sure, there have long been friendships between some evangelicals and some LDS folks. But they have not appeared on the public radar screen. Our public relations between our two communities have been-to put it mildly-decidedly unfriendly. From the very beginning, when Joseph Smith organized his church in 1830, my evangelical forebears hurled angry accusations and vehement denunciations at the Mormon community-a practice that continues from some evangelical quarters even into this present day. And I think it is fair to say that some Mormons have on occasion responded in kind. Friendship with each other has not come easily for our two communities. But in recent times things have begun to change. Evangelicals and Mormons have worked together on important matters of public morality. Here in Utah, the Standing Together ministry has been willing to take some considerable risks in countering the more aggressive and disruptive evangelical attacks against the LDS church. And Pastor Greg Johnson's well-attended dialogues with Professor Bob Millet have done much to model a new spirit of frank but friendly exchange about important faith topics. And now this evening we are experiencing the gracious hospitality of the LDS leadership, who have welcomed us all into this meeting place, which has played-and continues to play-such an important role in the life of the Mormon community. On a personal level, over the past half-dozen years I have been a member of a small group of evangelical scholars who have been engaged in lengthy closed-door discussions about spiritual and theological matters with a small group of our LDS counterparts. We have not been afraid to argue strenuously with each other, but our arguments have been conducted in a sincere desire genuinely to understand each other-and in the process we have formed some deep bonds of friendship. I know that I have learned much in this continuing dialogue, and I am now convinced that we evangelicals have often seriously misrepresented the beliefs and practices of the Mormon community. Indeed, let me state it bluntly to the LDS folks here this evening: we have sinned against you. The God of the Scriptures makes it clear that it is a terrible thing to bear false witness against our neighbors, and we have been guilty of that sort of transgression in things we have said about you. We have told you what you believe without making a sincere effort first of all to ask you what you believe. We have made much of the need to provide you with a strong defense of traditional Christian convictions, regularly quoting the Apostle Peter's mandate that we present to people like you a reasoned account of the hope that lies with in us-but we have not been careful to follow the same Apostle's counsel that immediately follows that mandate, when he tells us that we must always make our case with "gentleness and reverence" toward those with whom we are speaking. Indeed, we have even on occasion demonized you, weaving conspiracy theories about what the LDS community is "really" trying to accomplish in the world. And even at our best, we have-and this is true of both of our communities-we have talked past each other, setting forth oversimplified and distorted accounts of what the other group believes. I have formed some wonderful friendships with Mormons in the past few years. These friends have helped me to see the ways in which I have often misinterpreted Mormon thought. To be sure, as a result of those conversations I also remained convinced that there are very real issues of disagreement between us-and that some of these issues are matters of eternal signficiance. But we can now discuss these topics as friends And tonight many more of our friends have come together in this place for a very public and large-scale "Evening of Friendship." God be praised! In just a month and a half we will greet the year 2005, which marks the 200th anniversary of the birth of Joseph Smith. During this year there will be many occasions to pay special attention to Joseph's life and teachings, and I hope many in the evangelical community will take part in those events. But this evening we are not here to talk about Joseph Smith, but about the One whose birth we will celebrate again just before the bicentennial year of Joseph's birth makes its appearance. This is the One about whose birth we sing-in words, I should add, that many of us love to hear sung by that great choir that sings these words in this Tabernacle-"the hopes and fears of all the years are met in thee tonight." What a wonderful thing it is that we can meet together to talk about the Lord Jesus and about who he is and what he has done on our behalf. There is much here to talk about. I personally take great encouragement from words that Joseph Smith uttered on the occasion of the founding of the Church of Jesus Christ of Latter-day Saints in April of 1830: "we know," Joseph said, "that all men must repent and believe on the name of Jesus Christ, and worship the Father in his name, and endure in faith on his name to the end, or they cannot be saved in the kingdom of God." And then he added: "And we know that justification through the grace of our Lord and Savior Jesus Christ is just and true, and we know also that sanctification through the grace of our Lord and Savior Jesus Christ is just and true, to all those who love and serve God with all their mights, minds, and strength." I greet you this evening in that spirit-as one who wants more than anything else to love and serve God with all my might, mind and strength, in the power made available by the amazing grace that sent the Lord Jesus to Bethlehem's manger, and to the Garden of Gethsemane, and to the Cross of Calvary, where he shed his blood to pay the debt of our sin-a debt that we could never pay on our own. This is the spirit in which Ravi Zacharias is going to speak to us this evening-the spirit of devotion to the One whose name is above every name, the One who alone is mighty to save, and before whom someday every knee will bow and every tongue will confess that he is Lord to the glory of the Father. May this wonderful "Evening of Friendship" point us all to that great day. Thank you and God bless you. Prior to your November 14 speech at the Salt Lake Tabernacle, Dr. Richard Mouw, President of Fuller Theological Seminary, is reported to have made numerous statements, some of which have caused a great deal of concern within the apologetics/cult evangelistic ministries. apologized to Mormons for the "Evangelicals" who "have often misrepresented the faith and beliefs of the Latter-day Saints." stated, "Let me state it clearly. We evangelicals have sinned against you" and added that "both camps have tended to marginalize and simplify the others' beliefs. "hoped that "...many in the evangelical community will take part in" the "200th anniversary of Joseph Smith's birthday next December" and "several scholarlyevents planned to celebrate during the coming year" as well. Ravi, no one is blaming you for Mouw's statements, but according to Christian sources who attended the meeting, no one--including yourself-- stood up and responded to Mouw, either during or immediately after his speech. This is disturbing in and of itself, and I am amazed that the Christians in attendance sat and did nothing. Indeed, Mouw's "stunningly candid" apologies to the Mormons not only painted apologists and cult-evangelists as the bad guys, they are ridiculous, uncalled for and a spiritual slap-in-the-face to anyone who has taken the time to share, in love, the truth of God's word with those being deceived by the cultic doctrines and leadership of the Mormon church. Although Mouw took it upon himself to speak for apologists and cult-evangelists worldwide, rest assured that his statements do not speak for myself or my colleagues. In spite of Mormonism's blatant attacks on historic Christianity, we love Mormons enough to share the truth. But we love our Lord and Savior more, enough to defend the faith against another Jesus, gospel and spirit (Jude 3; 2 Corinthians 11:3-4; Galatians 1:6-9). Personally, since my ministry began in the early 1980's, I have done nothing to physically or spiritually harm a Mormon, nor do I know of anyone who has. Christianity didn't start the fire, Ravi. We both know that. But Mouw's statements, coupled with his ongoing association with known Mormon officials and apparent sympathizers, has caused a growing number of concerned Christians to become suspicious as to what may prove to be a seductive, swift-moving agenda to blend historic Christianity with the cult of Mormonism. Needless to say, it should come as no surprise if Mormonism is eventually recognized by the masses as legitimate within the body of Christ. Have no fellowship with the unfruitful works of darkness, but expose them (Ephesians 5:11). Mouw must be held accountable for his statements. He needs to repent and apologize to those who work tirelessly to promote the real Jesus to the Mormons, as well as other non-Christian cults. Ravi, since I was unable to attend your speeches, and since you are "Well-versed in the disciplines of comparative religions, cults, and philosophy" ( Ravi Zacharias Bio), I will assume you stood strong in the faith and defense of the real Jesus and the truth of His word (2 Thessalonians 2;15; Jude 3). If this is so, then I pray God will use your words to touch the hearts of those in attendance. If not, then please search your heart and consider an immediate separation from those who may be using your name and popularity for an agenda to, again, blend historic Christianity with the cult of Mormonism. While plans are underway to provide your speeches to the public, I would appreciate an unedited transcript of your November 14 speech at the Salt Lake Tabernacle. "The truth or falsity of a statement about being a Christian is governed by what Christ taught and what the word of God says. It isn't by what church you belong to or what theological perspective you have. The truth is the gospel itself. Now, the gospel is very clear, and Mormonism cannot be Christianity--not because I say so or because we take a vote on the subject in the Christian church--it can't be Christianity because it denies the doctrine of God and says there are many gods; it denies the doctrine of Christ and says He is a god, when the Bible says He is God in human flesh. It cannot be Christian because it teaches that the virgin birth is sexual relations between a resurrected god and the virgin Mary--to produce Jesus of Nazareth. It cannot be Christian because it denies salvation by grace alone and adds human works, which Paul says, destroys the gospel. It cannot be the gospel of Jesus Christ because it's another gospel, another spirit, another Jesus [2 Corinthians 11:3-4]...We love Mormons. We want them to come to know the real Jesus Christ. But we would be remiss in our function as Christians if we did not tell the whole counsel of God. And the whole counsel of God says this is Christianity. Mormonism is not Christianity; it is polytheistic; it is eternally polygamist and it is thoroughly pagan" (Walter Martin, "Mormon Officials and Christian Scholars compare Doctrine," The John Ankerberg Show, video segment aired 11/20/04). Be ye not unequally yoked together with unbelievers: for what fellowship hath righteousness with unrighteousness? and what communion hath light with darkness? (2 Corinthians 6:14). Therefore, Ravi, with the above in mind, I would appreciate your providing me with a statement based on what Mouw said during his speech. Thank you, Ravi. I look forward to your reply at your earliest possible convenience. As a person who has worked in ministry to adherents of alternative spiritualities for many years, and who previously has served on the board of directors for Evangelical Ministries to New Religions, and on staff with Watchman Fellowship, I think it might be appropriate to share an alternative view that the concerns expressed by Mr. Press. Before I begin, let me note something of my background and spiritual journey that has a bearing on my current perspective on the issues. Many years ago I was a member of the Reorganized Church of Jesus Christ of Latter Day Saints (a Mormon splinter group), before becoming a Christian and an evangelical. I eventually became involved in ministry through the counter-cult community where I served for many years. During this time, and continuing today, I have approached the study of new religions (popularly labeled "cults" in evangelical discourse) from a multi-disciplinary perspective, most notably informed by missiology. As a result of my studies and practical field experience, I no longer approach new religions from the counter-cult model. Instead, I believe a more fruitful approach is to understand new religions (including Mormonism) as an unreached people group, and to utilize a cross-cultural missions model. My comments below should be understood from this perspective. Background on the Temple Square event was provided to me through my colleague Greg Johnson. I find it amazing (shocking really) that this historic event was nearly brought to a hault, and continuing criticisms threaten a repeat of this in the future, not through complaints from Mormons or the LDS Church, but rather through evengelicals. And the criticisms as we find exemplified below have come through a specific part of evangelicalism, the counter-cult community. I appreciate the work that many in the counter-cult have done over the years in helping the church to define and defend her theological boundaries. The Scriptures surely teach us that we must understand what we believe and why we believe it, and that when necessary, we must defend the faith delivered to the saints. However, in my view, and the view of a growing number of evangelicals internationally, the counter-cult method of heresy refutation results in an unnecessarily confrontational approach that builds more fences between evangelicals and those in new religions than it builds bridges. I fear that we have taken a handful of biblical texts that warn of false teaching *within* the church, and have used them inappropriately as a foundation for evangelism to alternative spirituality adherents outside the church. The church might be better served in the future by re-examining not only our attitudes, but also the Scriptures in order to recover a winsome, dialogical, and culturally-sensitive approach as modeled in a number of biblical texts (e.g., the Samaritan woman in John 4; Paul among the Pagan philisophers in Acts 17). I'd like to pass along a few comments specifically responding to Mr. Press' concerns about Richard Mouw's comments in Temple Square. I believe it was entirely appropriate for Mouw to apologize for misrepresenting Mormonism, because we have. Evangelical polemics on Mormonism seem more interested in attacking 19th century Mormonism rather than understanding and responding to 21st century Mormonism and a religion that is in a state of flux (as are all religious traditions). A secular sociologist, Douglas Cowan, recently published a book entitled "Bearing False Witness?," and in this book he documents the serious problems besetting the evangelical counter-cult community, not the least of which is misunderstanding and misrepresenting non-Christian religions. In light of the biblical command not to bear false witness agains our neighbor, is there not a place for a public apology to Mormons for our sins? Those of us adopting a new model for ministry to Mormons and other new religions believe there most certainly is. Dr. Zacharias, you are to be commended for accepting the invitation to speak in Temple Square. And those leading evangelicals who participated in this event with you (Craig Hazen, Craig Blomberg, Joseph Tkach, Greg Johnson) are to be commended as well. You have modeled a new way of ministry that moves beyond fear, defensiveness, and confrontation to loving engagement that incarnates the gospel in culturally-appropriate ways so that the gospel may be understood. I am encouraged by the Temple Square event, because it is yet another example that a new paradigm is emerging among evangelicals in response to new religions. The confrontational counter-cult methodology has seen its day, and God is doing a new thing. I am glad that you are a part of it, and that God is pulling together a growing network of evangelicals. Somebody should have Mouw ask Millet if he still sings out of the LDS hymn book "Oh My Father" where it plainly says that there's a Heavenly Mom, and also ask how long have they been married, aren't we literal begotten children of them in a pre-earth state, and ask if D&C 132 does in fact teach that we can grow up to become "omnipotent gods" as God is. Millet has plainly stated that we aren't a different species from God, so there's no way he and LDS can play the Eastern deification card! [In reference to Mouw:] What Dave Hunt book is he talking about? I'm wondering if there's an adequate understanding here of the disconnect between the Mormon laymen and academicians (sophists?)? Mouw has got to be kidding! This is pathetic. If Walter's book is so bad, why didn't Ravi correct it when he reedited it. I have read most of Dave Hunt's books and he documents his comments. I can't believe this guy discounts "as man is, God once was; as God is man may become" . Hinckley tried to squirm out of this doctrine when confronted by a national magazine. Show me where he actually denied it. How could he when Prophet Snow made the above comment? Holy wizards Batman, that is the heart of the Mormon gospel. That is their equivalent of John 3:16. This is their mini gospel. If it isn't, every thing I was taught for 15 years as a Mormon was a lie. As to the African American comment, don't make me "barf. Show me one Mormon who took it that way. I could comment on the rest of this pathetic respones, but I will leave that to cooler heads than mine. I am sorry if you believe I misrepresented your prayer. In my written review of the Tabernacle meeting, my thoughts concerning your closing prayer were not in any way represented as a direct quote. They were my very honest personal feelings concerning the message your closing prayer conveyed to the audience. Even as I read your prayer below I think the underlying message is that - 1. James taught us that God will give wisdom generously to all who ask Him for this precious gift. 2. Joseph Smith, Jr. sought wisdom (truth) at a crucial time in his life. 3. God has promised to answer such heartfelt prayers. 4. We should all be willing to do the same... And that is what my review stated. I don't know you personally and I certainly have no reason to dislike you. I did not nor do I judge the motives of your heart in saying what you said. I only passed on my personal opinion of the messages that I heard Sunday night. I would have had absolutely no problem with your prayer if you had not used Joseph Smith (a false prophet) as an illustration in a positive light. I have lived in Utah as a Christian missionary pastor to the LDS people for 13 years and I believe comments such as your positive reference to Joseph Smith sends a totally wrong message to both Mormons and uninformed Christians. I cannot comprehend why any believer would in any way shape or form publicly use Joseph Smith as an example in a positive light. This only lends credence to a person who has deceived millions with his abominable doctrines. These type of comments do great harm to the cause of Christ in Utah and hinder our ministry to lost LDS people who are in desperate need of a Saviour. Quite a number of people from our church attended the meeting, several of whom are converted Mormons. Rozee (one of those converted Mormons) expressed the same reaction to your closing comment that I did. He told me when you used Joseph Smith as an example of how a person should seek for truth his eyes popped wide open... he just couldn't believe what he heard. I also received a number of e-mails from individuals who attended the meeting, all of which agreed 100% with my review of the meeting. None (except you) were critical in any way of my review. As I stated above I am sorry if you feel I misrepresented your thoughts. From my perspective I did not misrepresent the message conveyed in your prayer. My review was intended to hold those who made (in my opinion) foolish or irresponsible comments accountable for their actions. I am very glad that you contacted me and I would love be completely fair with you. I will not retract my honest opinion of Sunday night's event. But, if you would like to send a short note explaining your purpose for using Joseph Smith as a positive example of one who went to God for wisdom, I would be more than willing to pass on your retraction to those I communicate with. I would like for you to have the opportunity to publicly correct what in my opinion was a serious error. My purpose for writing this review is not to lash back at or hurt those who made foolish or irresponsible comments. I only want to hold these high profile brothers accountable for what they say in public. I want them to know that when they make such comments, they damage the reputations of many good and responsible anti-cult ministries. I also hope they will come to understand that quoting a false prophet (such as Joseph Smith) in a good light does much to lend credence to that false prophet and his abominable doctrines. For the sake of Christ and for the sake of those who are lost in the false religion of Mormonism, I would hope that these men would consider making a public statement in an attempt to correct the error that has been perpetrated. Re-read in the above post what he prayed/read. He simply said, "Your servant James taught us that God will give wisdom generously to all who ask Him for this precious gift. Even the Mormon Scriptures say that Joseph Smith, Jr. sought wisdom at a crucial time in his life. No one in this room should ever fear asking You, oh gracious Father, for wisdom. So in a common voice we ask you to give us divine wisdom and the truth about You, about Your Son, about Your Holy Word, and about Salvation. You have promised to answer such heartfelt prayers, and I ask that You would not let a single person leave this great hall tonight without the light of truth being kindled in his or her soul." I agree with Craig that we should do this. We should ask God for wisdom in everything. There are good people who think that James 1 can also be extended to intellectual trials, and they wouldn't deny that the Lord leads us to answers via prayerfully searching the Scriptures and natural revelation. The problem may be that Smith's account is so fraught with contradictions that it's dubious he ever did it. But then again, I've used "Samuel the Lamanite" in the Book of Mormon as "an" example of the legitimacy of street preaching. So what? Sadly, for too many Christians, anything that smacks of imitating Smith is of the devil. But this is just myopic. Smith was an American. Oh my gosh, we should all move out of the country now? Silly. Yea, I do see your point and I agree in principle with all that you said. I understood the message Craig intended to present in his prayer. I have no problem with intended message. My problem has to do with how Mormon people would view the prayer. Don't you think tying Joseph Smith with James 1:5 and earnestly seeking for truth might lend credence to what they have been taught? Mormon people believe -- Joseph read James 1:5... He felt a need to seek for wisdom... He went into the woods and earnestly prayed... God has promised to answer such heartfelt prayers... (whether he actually did all of this is questionable but Mormon people are convinced that he did). My problem is not with Craig Hazen, I believe he is a brother in the Lord and I don't believe he intended to send a mixed message. My concern is for LDS people and presenting to them a clear message of truth. Did Craig send a mixed message or a clear message? If it was clear why all the hubbub about his prayer? You are still my most favorite missionary... even though our minds are not wired the same way. Q: Did I miss that paste? Don't know what he ACTUALLY said, but can guess from his responses that it was pretty much what's been going round. But who would think that I was speaking about and on behalf of all white people? Comment: Probably when the speaker is a recognized leader of whites. Or, in this case specifically, when a person is a recognized leader among Christians. But here is an obvious example of more recent vintage: when Dave Hunt writes a whole book whose main thesis is that Mormonism is Satanic in its inspiration and practice, I think this is bearing false witness. Question: Where did, then, the Mormon religion originate? 1. Fallen man's best intentions: While I could say volumes about the implications what humanities best intentions look like apart from God, let me just run with this in another direction for a moment. If Mr. Mouw believes that the Mormon faith was born out of good intentions, then he must also believe that it was NOT Joseph Smith's intention to practice gross deceit. If this IS the case we must conclude that there WAS a stack of golden tablets, a gaggle of angelic visitations, and a true prophet of God that we's all simple folk wid no high-fo-luttin' Fuller deee-gree just plain missed! I think I feel a burning in my bossom right now: no, no just heart burn' or heartache over Mouw comments. 2. We could say that it was a product of Joseph Smith's WORST intentions. Then, perhaps, we CANNOT say it was solely Satan's pet project. However, we CAN conclude that Joseph Smith found Satan's ASPIRATIONS inspiring i.e. inspired by the example Satan set with his own ambitions to be like the Most High. I suppose when you take this all into account you are left with a man who is (a) a child of the devil, who (b) was, indeed, inspired by the devil. 3. Or, we could just say that it WAS Satan's pet project. It kind of fits Satan?Ä´s M.O. Appearing as an angel of light: deceiving humanity into thinking that he can become like God, sowing the seeds of false religion, appearing in gardens/groves. If indeed this is the case, we must also conclude that, like Adam before him, at some point Smith had a free-agency choice to champion a lie or surrender to the truth. On a more technical point, I have received emails in the past few days where evangelicals have said that Mormonism teaches that God was once a human being like us, and we can become gods just like God now is. Mormon leaders have specifically stated that such a teaching, while stated by past leaders, is something they don't understand and has no functioning place in present day Mormon doctrine. [T]his is not an official Mormon teaching, even though it can be found in non-canonical Mormon writings. Comment: You've got to be kidding. While I could cite all the quotes, old AND recent, there are people on this e mail list so much more qualified to do that than I. Let me just leave it at this: page 305 of Gospel Principles (a very official teaching document) which quotes The Teachings of Joseph Smith pgs 345-346. It is the chapter regarding Exaltation which states, that we will become gods. It says that this is the way our Heavenly Father became God--He was once a man, like us. While such a doctrine is embarrassing to explain before detractors, thus deemphasized in mixed circles, it is an essential teaching of the Mormon faith; a doctrinal linch-pin that, if removed, tumbles other eternal beliefs from the obvious (eternal marriage) to the not-so-obvious (the nature of Christ). Question: I would like to see a collection of quotes where the doctrine is denied by Mormon leaders. I can then match them up with quotes from the same individuals endorsing the doctrine. Would make for an interesting study. Another point: I have been told by many evangelicals that Mormons believe that the atoning work of Jesus Christ was accomplished in Golgotha and not at Calvary. Comment: Though LDS teaching often focuses on Gethsemane, I have NEVER told anyone that, according to th Mormons, the work of atonement was finished there. No apology. Bob Millet has demonstrated from Mormon writings this this is not true-if the Cross had not occurred, he says, we could not be saved. Here, for example, is how the LDS writer Glenn Pearson described the requirements for salvation in a popular Mormon book of the 1960s. Comment: Why is Mouw allowed to quote non-canonical sources to support a near orthodox agenda on behalf of Mormons everywhere when he implies that doing so to prove OTHERWISE is out of bounds. I don't need to remind anyone here that Gospel Principles tells us that Baptism is required for salvation, and the word grace does not appear in the book's glossary. I hoped that many evangelicals would participate in those events that would allow us all to pay special attention to Joseph's life and teachings during this year. I see this bicentennial year as a time when we evangelicals can try to sort out the good from the bad in Joseph's thought. Comment: I believe special attention has, is, and will be given by Evangelicals everywhere. However, it is this special attention, this sorting out, that Mr. Mouw is apologizing for. Get my drift? In Conclusion: I do AGREE with Dr. Mouw's thoughts regarding finding common ground upon which we can build a healthy dialogue with Mormons so we can earn their attention when we approach the abominational (ok that's not a word but who cares!) teachings that are leading them straight into eternal darkness. In my humble opinion, however, the forum to do this kind of bridge-building in is where you are certain of a continuing dialogue. Many of the people Mouw addressed that night will NOT be engaging in further dialogue with Mr. Mouw they will come away feeling very good about Joseph Smith and the Mormon faith. They will come away feeling very right, knowing that the evangelicals have been so very wrong. This is, indeed, my approach with Mormons. They keep coming back because I find common ground. However, I do NOT do so at the expense of truth and I do not do so without refuting error and giving truth, with gentleness, humility, and respect. In Short: Hey, you Utahan Evangelicals. DAMAGE CONTROL! DAMAGE CONTROL! Dave, I am as astounded at this latest genre of "apologetics" as is Dan, Rauni, etc. Mr. Mouw's backpedaling of his conduct at this ungodly Standing Together gathering, is nothing short of nauseating! Why on Earth would we find ANYTHING redemtive or beneficial in studying the inconsistent ramblings of a madman, who professed to be God's sole spokesman on the globe, and who put his accomplishments above those of Jesus Christ? Is it no longer in effect to anathematize (Gal 1:6-9) people who teach a false gospel, worship false gods, teach false Christs and consistently engage in secret, occult practices which must offend the true God of the universe? I think it is a dangerous and ungodly practice to strike out and "dialogue" with men who are deliberately deceptive, and who make it a profession to confuse the naive of Christian academia. It is at least in my opinion, the only excuse I can find for Mouw and his ilk, that they have walked like blind kittens into the slick and clever think-tanks of the Mormon machine! It is tragic that they waste precious time in finding something we allegedly have "in common" with those false prophets. Unfortunately this is nothing new. Mormons have been trying to bait Christians into their double talk for over a century. Until now, very few have taken their bait because of the obvious (to most) bobbing and weaving when it comes to revealing their true teachings! I am reminded of one local Mormon "egghead' who used to follow us wherever we spoke. He categorically denied that Mormons believe in a Heavely Mother, God's wife. When I showed it to him, black on white, from his own prophets, he instantly replied "but it's not our official doctrine" However, when I pressed further and asked "but do YOU believe it?" He replied "of course I believe it. I believe it because it is true!" Such is the "logic" of Mormonism. Walter Martin, God bless his diligence, called it "nailing Jello to a tree". I suspect there is going to be a lot of Jello flowing between those who make it a sport to dialogue with the Devil. As for me and my house, we will heed the warning of scripture that says: "..charging them before the Lord that they strive not about words to no profit, but to the subverting of the hearers....but foolish and unlearned questions avoid, knowing that they gender strifes." (2 Tim 2) When all the egos have had their fill, and all the flattery is over (on both sides), perhaps Evangelicals will just go back to the plain and simple sharing of the Gospel with lost Mormons, having the courage to inform them first of all, that they ARE lost! This is my sincere prayer. Of course Deseret News would put a Mormon spin on everything. If anything can be twisted or turned so that it would make Mormonism look like Christianity, they would do it. However, we tend to believe the newspapers. We see quotes from various papers in this discussion board almost daily, and I am not sure that they have been authenticated any more than we trust that reporter who puts his/her name on the article is reporting truthfully. They should - if not, they are risking their own jobs, don't they? I too read that article (11/16/04) in Deseret News about Michael Card. There were some direct quotes that alarmed me. One is: "It's more important to be faithful than right." What does that mean? I don't get it. The article also says that "CARD SAID that he doesn't see Mormonism and evangelical Christianity as opposed to each other. They are more like the two ends of a long thread - part of the same thing." Did he say this or did he not? In the article there were only two "seemed to be"- statements - one was referring to why Zacharias has chosen Card to sing there. Zacharias had said that Card "seems like just a right choice." The other one said that Card "seemed to [be] open to all kinds of possibilities", saying that just before he commented that it was more important to be faithful than right. Now it "seems" to me that the article actually reported what Card had said. Having a graduate degree in theology does not necessarily mean that one knows the differences between Mormonism and biblical Christianity. Richard Mouw is a perfect example of ignorance in that, is he not? And he is the President and professor of Fuller Theological Seminary! Christians applauded when Ravi spoke on these subjects, because they understood. I wish Mormons could have understood, but they did not. They hear Christian speakers all the time, without understanding at all. A Christian lady, just a few days ago, told me about a Returned Missionary and active LDS, who daily listens to J. Vernon McGee and cannot not see any differences between McGee's teachings and LDS teachings! He intreprets the words using a "Mormon dictionary". Speaking to a Mormon audience is a lot different than speaking at Universities and Christian churches. If we were given early on in our childhood or youth a different interpretation to these words, God, Jesus, Trinity, Salvation, Atonement etc, we would not understand either, right? Been there, done that. I have read many letters this week - some very pro-Ravi's presentation. I agree that his presentation was fine - for Christians. For Mormons it may have also seemed "good", the way they understood it, but not how it should have been understood. If I was a betting person, I would bet that they did not get at all what Ravi meant. Those on the platform (GA's and BYU professors) knew - they understood, but rest of the Mormons did not. Those among us who once were active, temple-going Mormons, can see that the message Ravi gave, did not reach them so that they could see the difference. If you think that they understood even 10% of what Ravi was saying: that Jesus is eternal God, and salvation in heaven (in one and only heaven) is the gift of God that cannot be earned, and all else he said, you have never been totally brainwashed in this powerful cult, you have never been "totally believing Mormon" or TBM . Or it has been so long ago when you "snapped out of it" that you have forgotten the "Mormon-double-think", that they can believe two opposing ideas at the same time and bear testimonies of both of them. I could give many examples of that from our 20+ years of witnessing. Let us pray for each other and be faithful in this work to which God has called us. POSITIVE: I do think Ravi's talk was fine and could result in some great observations. One problem I have noticed in ministering to Mormons is that many, and I mean many, of them really do not understand or know what we as evangelicals believe, especially when it comes to the issue of salvation by grace. Not to mention Trinity stuff (good grief). I think that although most Mormons probably DID filter what Ravi said through their own LDS doctrinal views, at the very least, they got a chance to hear a respected evangelical and think to themselves, "hey maybe we have evangelicals wrong in some ways." NEGATIVE: RIchard Mouw's comment about celebrating Smith's birthday was just over the top. But in his response, I believe he noted as much, saying: "I was thinking and speaking too much as an academic on this one, and I know that doing so created unnecessary confusion." (response sent to Keith Walker, posted at AR-Talk). So I say, "ok, fine." Anyone of us can remember speaking somewhere and saying something not quite right". I can only imagine the pressure Mouw must have been under. And I do understand his desire to express an apology of some sort for the behavior and false accusations of SOME evangelicals regarding LDS beliefs and practice. I was just talking to an evangelical mother the other day concerned about her daughter's friendship with a Mormon because she thought Mormons worshipped Satan in the temple. Clearly, she heard/learned this from somewhere. I do believe that LDS-EV dialogue MUST change. The days of serious confrontational war, in my opinion, are over. At least they are for me. I see a better way, a more Christ-like way, to approach Mormons and Mormonism (this does not mean compromise). I have sought to express how I see the future going in my book "Becoming Gods," which includes a brief appendix by my friend, yes my friend, Daniel C. Peterson. I like Dan, we are friend. BUT we still can disagree, publicly and privately. We do not hold back, but are not insulting. And, I think more importantly, willing to listen to each other and learn, and think the best of each other. I wanted him to include his thoughts in my book so readers could see the heart of a well-respected Mormons. Their motives and intentions, I think, have often been misunderstood. KeithWalker wrote: "BTW, Everyone is focusing on Mouw's comments? What did you think of Craig Hazen's prayer?" Both Drs. Hazen and Mouw wrote their texts prior to speaking (praying), therefore, both are fully responsible for what they said. They approached this event as "historical," just as Johnson advertised it, therefore what they wrote was well thought out in advance, edited, and finalized prior to the event. They made themselves clear and now, in hindsight, both men are writing texts longer than their original speeches trying to explain away their obvious blunders. They meant what they said the day of the event because both men are too smart to not have written it differently. The only thing that their afterthoughts convince me of is that they believe that damage control is better than an an outright apology to the Christian body. An old missionary friend of mine used to say "He who eats with the Devil must use a very long fork." In this case all of these men dined with the Devil and apparently regret certain parts of it (judging from their afterthoughts), they therefore should dine at our Lord's table next time and stay away from the table set by false teachers. You mess with bees and you will get stung. So it is when they messed with Brigham's Beehive. I do not know Mouw personally and Hazen I've only met twice, but I like him and I would like to talk with him about this. Mormons can overcome critics of the religion by being friendly and welcoming. Gordon B. Hinckley spoke yesterday to 1400 members in West Columbia. The 94-year-old leader and prophet of the church said his third trip to the state would likely be his last because of his age. There are about 30,000 Mormons in South Carolina. This is EXACTLY what is happening now. They aren't addressing their lack of orthodoxy, but instead are focusing on orthoproxy. They are hoping that people will see their good deeds and will just accept the doctrine "because they are such nice people." For years this scheme has worked on the uninformed Christian. Unfortunately, now it is working on those who should know better. My name is Chip Thompson and I have been a missionary to the Mormon people for 13 years. By God's grace my family and I were able to plant a Bible believing church in the rural town of Ephraim, UT. Ephraim is located in Sanpete county which is over 95% LDS. Our church today consists of about 100 members over half of which are LDS converts. We love LDS people and we have been effective in reaching them for the Lord because we have spoken the truth to them in love. I attended the meeting at the Tabernacle and was astounded by many of the comments which were made. You may have read my critical review of the meeting and if you did, I want you to know that my intent was not to hurt you or judge the intent of your heart. As iron sharpens iron, I do hope to influence you, even in some small way, to be much more careful with your words in the future. My greatest concern is for the LDS people that I have given my life to reach for Jesus Christ. I fear that the message you intended to convey and the message that LDS people heard in the Tabernacle that night were two very different messages. You said... "First, some folks have asked who the "we" is that I apologized on behalf of when I said that that "we" evangelicals have sinned against Mormons by bearing false witness against them. I certainly did not mean to imply that every evangelical has sinned in this regard." I attend the Mormon Miracle Pageant each year in Manti, UT, and over the loud speaker system the LDS church broadcasts this basic message (this is not a word for word quote) -- The Church of Jesus Christ of Latter-day Saints encourages truth of all sorts. We would, however, strongly advise you not to take any printed literature on the streets which does not clearly display the church logo on the front cover. Richard, have you personally ever tried to hand a tract to an LDS person? If not, Good Luck! The LDS church has done a very good job of brainwashing it's people into listening only to what the LDS church has to say, this sounds just like a cult to me. Yes, when you said -- WE -- LDS people took that as a blanket statement affirming what they have been taught their whole lives, namely that all who oppose the LDS church are sinning against them. They would have viewed you as the only honest evangelical they have ever heard speak on this subject. The truth, however, is that the vast majority of anti-cult ministries are very honest and very accurate in their arguments against the Mormon church. From my experience the vast majority of anti-cult ministries also reach out in love to LDS people. It is a very small minority that approach LDS people in a hostile and unloving way. You also said... "On a more technical point, I have received emails in the past few days where evangelicals have said that Mormonism teaches that God was once a human being like us, and we can become gods just like God now is. Mormon leaders have specifically stated that such a teaching, while stated by past leaders, is something they don't understand and has no functioning place in present day Mormon doctrine. Bob Millet has made the same point to many of us, and Stephen Robinson insisted, in the book he co-authored with Craig Blomberg, that this is not an official Mormon teaching, even though it can be found in non-canonical Mormon writings." Richard, I have a question for you, are Bob Millet or Stephen Robinson general authorities of the LDS church? The answer is NO. Have you read any of the classic 20th century works by the LDS general authorities on this subject? Such as Doctrines of Salvation by LDS Prophet Joseph Fielding Smith, Gospel Doctrine by LDS Prophet Joseph F. Smith, The Miracle of Forgiveness by LDS Prophet Spencer W. Kimball, Mormon Doctrine by LDS Apostle Bruce R. McConkie, etc. etc. etc. These books are in virtually every LDS home library. I could quote from each of those books and totally disprove your statement above. To make my point, however, I will quote from a current manual printed in 1997 by the LDS church entitled Gospel Principles. This manual was specifically prepared by the LDS church for the purpose of teaching the basic principles of the LDS gospel to new members. It is a guide to help LDS families with their family home evening lessons and to help prepare lessons for LDS church meetings. In the first chapter we learn... "that God has a body that looks like ours... (and) Everything that he does is to help his children become like him -- a god." pg. 9. In chapter two we learn... "All men and women are... literally the sons and daughters of Deity... Man, as a spirit, was begotten and born of heavenly parents," (a father god and a mother god?) pg. 11. In chapter three we learn... "We needed a Savior to pay for our sins... Our Father said, "Whom shall I send?" ...Two of our brothers offered to help. Our oldest brother, Jesus Christ, who was then called Jehovah... (and) ...Satan, who was called Lucifer... Jesus Christ was chosen," pg. 17-18. Chapter six teaches... "Some people believe that Adam and Eve committed a serious sin when they ate of the tree of the knowledge of good and evil. However, latter-day scriptures help us understand that their fall was a necessary step in the plan of life and a great blessing to all of us," pg. 33. Chapter ten teaches... "We believe the Bible to be the word of God as far as it is translated correctly" (Articles of Faith 1:8)... (but) the Book of Mormon... is "the most correct of any book on earth, and the keystone of our religion, and a man would get nearer to God by abiding by it's precepts, than by any other book" ... The Pearl of Great Price... clarifies doctrines and teachings that were lost from the Bible..." pg. 53-54. Chapter 12 addresses the issue of where and when our sins were atoned... "In the Garden of Gethsemane, the weight of our sins caused him to feel such agony and heartbreak that he bled from every pore... Later, as he hung upon the cross, Jesus suffered painful death by one of the most cruel methods known to man. (consider the discussion question at the end of is paragraph) Discussion - Ask class members to imagine themselves in the Garden of Gethsemane as witnesses of the suffering of Jesus Christ. Have someone read the account in Luke 22:39-44." (no discussion questions about the cross?) pg.73-74. Yes, the LDS does give lip service to the cross but the focus of the atonement is not the cross, it is the Garden of Gethsemane. The cross is not a symbol of Mormonism in any way shape or form... rarely if ever will you find the symbol of the cross in a Mormon Church or in devout Mormon homes. Chapter 16 discusses the Total Apostasy... "More and more error crept into Church doctrine, and soon the destruction of the Church was complete. The period of time when the true church no longer existed on earth is called the Great Apostasy... Soon pagan beliefs dominated the thinking of those called Christians... Members of this church believed that God was a being without form or substance... After the Savior ascended into heaven, men changed the ordinances and doctrines that he and his Apostles had established. Because of apostasy, there was no direct revelation from God. The true Church was no longer on the earth... As a young boy, Joseph Smith wanted to know which of all the churches was the true Church of Christ. He went into the woods near his home and prayed humbly and intently to his Heavenly Father, asking which church he should join... The Savior told him not to join any church because the true Church was not on the earth. He also said that the teachings of present churches were "an abomination in his sight" ...Joseph was to be the one to help restore the true gospel of Jesus Christ... On 6 April 1830, the Savior again directed the organization of "his Church on the earth" ...His Church is called the Church of Jesus Christ of Latter-day Saints." pg. 105-111. Richard, according to Mormonism all of our churches and all of our (your) doctrines are an abomination to the God of Mormonism, I wonder who their god really is? I think you get the picture... Gospel Principles is a modern day LDS manual that teaches all the abominable doctrines of Mormonism! These are lies and false teachings. The book teaches one false doctrine after another, chapter after chapter... then, you come to the conclusion of all these false doctrines in chapter 47 which is entitled -- "Exaltation... Exaltation is eternal life, the kind of life that God lives. He lives in great glory. He is perfect. He possesses all knowledge and all wisdom. He is the father of spirit children. He is a creator. We can become like our Heavenly Father. This is exaltation... If we prove faithful... We will become exalted, just like our Heavenly Father... These are some of the blessings given to exalted people:... 2. They will become gods. ...This is the way our Heavenly Father became God. Joseph Smith taught: "It is the first principle of the Gospel to know for a certainty the character of God... he was once a man like us;... God himself, the Father of us all, dwelt on an earth, that same as Jesus Christ himself did." ...He wants us to succeed even as he did." pg. 301-305. Richard, you are being lied to by Millet and Robinson. They are deceived, deceitful men who are taking you for a ride and using you for their own purposes. Have you never taken the warning in 2 Cor. 11:13-15 seriously? "For such are false apostles, deceitful workers, transforming themselves into the apostles of Christ. And no marvel; for Satan himself is transformed into an angel of light. Therefore it is no great thing if his ministers also be transformed as the ministers of righteousness; whose end shall be according to their works." You said... "In none of this am I saying that Mormons are "orthodox Christians." But I do believe that there are elements in Mormon thought that if emphasized, while de-emphasizing other element, could constitute a message within Mormonism of salvation by grace alone through the blood of Jesus Christ. I will work to promote that cause. Most of you will disagree with that approach. But at the very least admit that we have not always been fair in our wholesale condemnation of Mormonism as simply a false religion." Richard, again you have been led astray. Please read the book I quoted from above entitled Gospel Principles. You would have to rewrite 95% of the book in order to call Mormonism a Christian denomination. Very simply stated Christianity as a whole has been entirely fair in our wholesale condemnation of Mormonism as a false religion. Richard, I will wholely accept your apology for accidentally implying that we should join in the celebration of Joseph Smith's birthday centennial. We all at times imply things that we do not intend to imply. You said, "For the record: I do not believe Joseph Smith was a true prophet of God; I do not accept the Book of Mormon as a legitimate revelation; I do not believe that temple baptism saves; I do not believe that all people will be saved. And it is precisely because of this that when my good friend Bob Millet says that his only plea when he gets to heaven is "the mercy and merit of Jesus Christ," I want to respond by saying with enthusiasm, "Let's keep talking!" I hope this helps a little. I am deeply sorry for causing distress in the evangelical community. I make no apology for wanting to foster gentle and reverent dialogue with Mormon friends. But I want people to be upset with me only about things I really meant to say--and I failed on this occasion, on one important point, to make my case clearly enough. Blessings!" Richard, I say a hearty AMEN to the concept of reaching out in love (AND TRUTH) to LDS people... YES, let's keep talking. The problem I have is that some of the things you meant to say were dead wrong as I pointed out in the body of this letter above. Please don't take this wrong, but you need to do your homework. The majority of LDS people do not think like Millet and Robinson. The majority of LDS people believe they are on a journey to become Gods, just like God. Yes, keep encouraging Millet and Robinson toward true Christian doctrine, yes keep encouraging them to influence the LDS cult in the right direction but understand that the present day LDS church and it's leadership is a long, long way from the truth. Hope all is well! Was just pondering the "Ravi Weekend" some more, & wanted to comment on something I'm sure you noticed, which made me all the more aware of how careful we must be when witnessing to Mormons, or anyone with a different belief system. Remember the story Ravi told, of when he addressed the U.N., & a delegate came up to him afterwards? This fellow had been very moved by Ravi's words, & said that he hoped he & Ravi could be roommates in Heaven. Ravi responded by saying that he appreciated the sentiment, but figured that his wife may not appreciate that, in so many words. While it made an interesting story, my spirit sunk immediately at the thought that there would be Mormons in the crowd, who might interpret that as meaning that Ravi believed in the concept of celestial marriage. Hopefully it just went over most people's heads, but we must choose our words carefully & wisely! According to the biography of Christian singer Sankey who traveled extensively with Moody and accompanied him on his visit to Salt Lake, Moody preached in several churches there and was invited to speak at the Tabernacle but declined and never returned to Salt Lake again. Many Mormons were converted through his preaching and he never compromised his stand. Sounds like the story of Moody's speaking there could be an "urban legend"? You can find this information... [here]. A friend who has a large library researched and could not find any reference to any such speaking event. I believe Moody would soundly condemn the recent meetings by Zaharias and company. If there is other reliable information that would contradict Sankey's account, I would appreciate knowing the source. Thanks Rob, The evening news, the pre-cursor of the Deseret News, reports on Saturday June 3rd and on Monday June 5th, that D.L Moody and a Dr. Vincent from New York spoke at the Tabernacle. I have copies of both of these news reports and they are fascinating to read. Before Moody spoke on Sunday June 4th, John Taylor and Orson Pratt spoke. Moody's sermon was "Salvation for All." The LDS Tabernacle record states simply, "famed evangelist D.L. Moody spoke at the tabernacle today at the invitation of Brigham Young." We also discovered that Moody was back in Salt Lake in the fall of 1877 where he held meetings and according to Ira Sanky two daughters of then President John Taylor came forward to be converted. Oh to better know that history, but alas it is silent. He was invited to speak at the tabernacle this second time but for some reason declined. I agree with you. I believe that some good may still be salvaged from what happened at Utah but that we first have to deal with what impact it has had already. My friend told me a couple of days ago that some Mormons were evangelizing at his old school. So he talked to some of them, but there was a twist. This time it was different you see. He began to talk to them about their doctrines, and right off the top of the bat, they said "you're bashing us! don't you know that Richard Mouw apologized for you 'christians' already?" NO JOKE! He couldn't even begin to talk to them because they put up a new wall that we are not going to be able to take down anytime soon. We may stand on the shoulders of giants, but Mouw just shot them in the foot. And others, like Johnson, are getting there very quickly. Concerning Ravi's communication to the Mormon contingency & the girl who reportedly went away feeling 'good' as a Mormon: I think there is a large spectrum along which local Mormons fall, ranging from astutely and distinctly Mormon to generically & mildly religious. She sounds like so many I meet in the 2nd category - they'll agree with almost anything they hear unless it includes a plain & obvious repudiation or denunciation of Mormonism. But those who take it seriously (Mo's) would not be so glowing about it, even if it did fascinate them. I read a lot of field reports I require of the slcc students wherein they describe an experience of attending a church not their own. It's always interesting to read when they've gone to a mainstream Christian church; some will simply notice exterior differences but suppose it's basically all the same since they talked about Christ, but the more savvy ones will take note of things like trinitarianism, emphasis on the cross, hammering on grace, etc. Let's face it, for so many ignorant postmodern Mormons, the very fact that Mo's & evangelicals were in the tabernacle together would lull them into a 'good feeling' of validation as Christians. But I know of some, like the 50-something yr. old convert to Mormonism who teaches at the slcc Institute full-time & carries a huge chip on his shoulder as to what I & any other evangelicals think of him, who would zero in on Ravi's audacity to drop the Trinity so emphatically from that holiest of pulpits, and who would certainly think his dwellling on the cross and hammering on our spiritual death & hopelessness without Christ was 'too evangelical' and would find disagreements with it. Sure this guy's the exception to the rule among Mormons (here anyway), but I tend to think it's a plus to get any Mormon to ever hear genuine Christian teaching - to expose them at all to a dynamic presentation of Biblical truth is a plus. As to your guarded defense of Hazen's prayer, I should say that I felt just as much like puking on him as I did Mouw. Sure it's true that we should seek wisdom, but once again, going way over the top in this case was almost a disingenuous pandering to the Mormon contingent; it implies that perhaps Hazen (a) recognizes as vaild the faith-promoting hagiography represented in the standard legendary tale of Joseph going out to the grove, and (b) supposes that maybe Joseph really did ask God for wisdom and GOT IT. But Hazen believes no such thing - he probably doesn't buy any of the 'Work & the Glory' tale about Joseph, let alone any implication that he RECEIVED the wisdom he sought. Hazen probably (and rightly) believes that if there was any exterior spiritual force acting in the young Joseph, it was a spirit of confusion / deception. So why use him as an example? Anyway good dialogue after the fact, & I have been able to follow up with Mormons that I invited or prodded or bribed to go. I was fairly shocked to hear how (the great) Ravi Zacharias failed to make it absolutely clear that Mormons are NOT Christians. I was shocked, but not surprised. We seem to be living in an era where even among Evangelicals it is just not nice to cause a person to "feel bad" about their convictions, yet that was exactly what Christ came to do: To shake the foundations of the "good works" crowd and the "religiosity" of the Jewish leaders of that time. Christ WANTED people to feel bad about their mistaken views of God -- so bad that they would come running to Him. Though "Kingdom of the Cults" is certainly still my favorite resource, Hanegraff and Zacharias (future editors after Walter Martin) are definitely NOT Martin: Martin's sermons on the cults are so clear, so unquestionable, and it's a shame that the very folks who have updated his work don't take that same effort in their lectures. Ed Enochs has not been involved in dialogue with Latter-day Saint scholars. He was posting in the comments section of the Times & Seasons webblog. He probably should repent of something, but not for what he claims! The inflation of what he was doing is laughable, as well his claim to being someone whom people across the country are looking to for guidance on the issue. The only thing surprising about Enochs' comments at T&S (for those who have seen his rabble rousing over the years) is how long he was able to appear reasonable before imploding. Of course, I represent a church and you don't, so there will be obvious differences in methodologies to reach the same end. I appreciate your critique of the Tabernacle Event. I have to say, I was very upset by Richard Mouw's remarks. Especially disturbing was his "apology" - which was no apology at all. Someone needs to have a repentant heart for it to be a valid apology. I am dead set against one person assigning himself the role of Evangelical "pope" for the day, and assuming he can speak for the rest of us. And I just learned last week that the boys at the Seminary asked him not to offer his usual apology, warning him that it would not help the cause of Christ here in Utah. I don't know if you have noticed how much PR benefit the LDS church has received from this deal, but the only thing that now seems historic about the event is that it set our cause back ten to twenty years. We don't need outside help in destroying our credibility. The 200th birthday thing was a complete disaster. Hazen's remarks, were in my opinion, carefully worded, but misunderstood by the majority of LDS listeners. I accept your analysis as valid, but I don't think it is ever wise to give the impression that Joseph Smith ever did anything of benefit to anyone. I do not want to see him honored, set up as an example, or given any other attention. He is nothing, and we need to treat him with the appropriate derision. I just finished watching the Ravi lectures on DVD and I am not impressed whatsoever. Ravi just kept telling story after story, with the occasional Bible verse thrown in. He just kept beating around the bush, and never got to the center of the issues. Don't get me wrong; I understand he can't come on too strong. If he was to get up there and say that Mormons believe in a weak Jesus compared to the almighty Jesus of the Bible, and because of that Mormons are going to hell, then they are just going to get up and leave. But at the same time, being a Christian, Ravi has a responsibility to standup for the truth, regardless if the truth offends people (which in most cases it does offend people). I think if he had explained politely that the Mormon Jesus and the Jesus of the Bible are radically different, and that only one of them can be true, then truth would have been represented fully and not too many Mormons would have been offended. We need some more Evangelical apologists to speak in the Tabernacle, others who will stand up for the truth, such as Robert Morey, Josh McDowell, John Macarthur, and John Piper. Too bad Walter Martin, and C.S. Lewis never got a chance to speak in the Tabernacle. I find it strange that after both Erik McHenry and Greg Johnson of Standing Together were notified that Ravi was not the last Christian to speak in the tabernacle since Moody. The DVD on Ravi's Utah trip, which Standing Together put out ("In Pursuit of Truth"), says on the back that this was "the first Evangelical Christian address from the historic Salt Lake Tabernacle in over one hundred years." McHenry and Johnson both know that Kurt Van Gorden of the Utah Gospel Mission claimed a while ago that other Christians like Gen. William Booth of the Salvation Army have spoken there since. Either Van Gorden is misinformed or Standing Together continues to promote an inaccuracy to their own advantage. Kurt Van Gorden claimed to have notified Standing Together quite a while before Ravi came to Utah about the facts of Ravi not being the last speaker in the tabernacle since Moody. Van Gorden said that someone got back to him, and said something to the effect that they'd look into it. At the time Van Gorden was unsure who it was that responded to him when he confronted Erik McHenry of Standing Together immediately after Ravi's last event at Weber State. I was present at Weber State to watch this confrontation. Van Gorden listed to McHenry a handful of Christian speakers who had spoken in the tabernacle since Moody. McHenry told Van Gorden that he never heard anything about this. Both Van Gorden and McHenry determined that it may have been the secretary at Standing Together that responded to Van Gorden. Later Greg Johnson wrote me in the beginning of December to correct my newsletter that I posted on my site concerning my take on the whole Ravi event. Johnson told me that Van Gorden never told him anything about this. So I told Johnson that I never said Van Gorden told him anything. I said that Van Gorden had notified Standing Together (which includes more than Johnson) of the information. Isn't it possible that someone at Standing Together besides Johnson received Van Gorden's information? I told Johnson that I would change my newsletter to state specifically what Van Gorden "claimed" instead of simply stating that Van Gorden had done this. My newsletter specifically listed one individual that Johnson could have checked on, viz., Gen. William Booth of the Salvation Army. I also told Johnson that it was high time that he write Van Gorden. So I know that Johnson was at least aware of Van Gorden's information well in advance of the DVD release. Now Johnson writes me back on January 23, 2005 and tells me that he's confused about my questioning of him when he expressly told me in the beginning of December that he had no knowledge from anyone that Ravi wasn't the last speaker in the tabernacle since Moody. Johnson said that until I produce the evidence, he can't claim to know the facts. What Johnson fails to realize is first of all, I tried to alert him to someone that claimed to be an authority on the matter. Johnson is well aware of Van Gorden, and the former could have taken my advice and simply have written the latter to find out what the evidence is. Instead, it appears to me Johnson really doesn't care about the evidence. Johnson insists he does, but if so, why wouldn't he have at least checked Van Gorden's claim? Does Johnson really regard Van Gorden as an idiot who has no useful information? I certainly would have checked if I was in Johnson's or McHenry's positions (Johnson was the executive producer and McHenry was the assistant producer of the Ravi DVD). Further, I did give Johnson a piece of evidence. I gave him a name that he could have researched on his own, viz., Gen. Booth. How is that not evidence? Perhaps it could have been more detailed with time, etc., but I told Johnson where this information was found, viz., Van Gorden. That was the source of my knowledge, and it was Johnson's responsibility to look into it. Johnson also took me to be accusing him of lying, and that I was guilty of "slander and gossip". Where did I ever accuse Johnson of lying? The closest thing to this would be where I stated, "Either Van Gorden is misinformed or Standing Together continues to promote an inaccuracy to their own advantage." Isn't it possible that Van Gorden is misinformed? If so, then how would that be accusing Standing Together of lying? And isn't it possible to promote an inaccuracy for one's advantage which falls short of lying? Isn't it possible just to not care about the facts without lying about them? Finally, how is it slander and gossip to simply report the facts, especially when I have first hand knowledge of the events? What is untrue in what I am saying? The issue has become a public matter being disseminated through the press as well as on back of the DVD. 1895: Rev. Anna Shaw, may be the first female Protestant minister permitted to speak in the Tabernacle. 1898: On January 16, Roman Catholic priest, Dr. J. H. Reiner, addressed the congregation in the Tabernacle, Salt Lake City, with such a powerful defense of historic Christianity as compared the "restored" LDS gospel, that Mormon writers were still commenting on Reiner's message some forty years later! 1899: [Date unknown] D. L. Moody returns to Salt Lake City and preaches in the Tabernacle. 1899: On December 25, Apostle Ben E. Rich wrote a letter outlining several Christian ministers who preached in the Tabernacle, including Bishop Kingsley, of Ohio, Dr. Tiffany, of Iowa, and Dr. Allen, of Wyoming. No precise dates were given, but Apostle Rich also extended an invitation for the noted Christian minister, Dr. Thomas DeWit Talmage to speak in the Tabernacle. 1921: The Rt. Rev. A. W. Moulton, Episcopal bishop of Utah, spoke in the Tabernacle at a celebration for the 300th anniversary of the Pilgrims landing in America. 1922: At the July 24th celebration held at the tabernacle, the invocation was offered by local minister Rev. George S. Davies. 1928: On May 11, the Episcopal Church held a regional convention in Salt Lake City were permitted to use the Tabernacle for the concluding service. They were led by The Right Reverend Walter T. Sumner, bishop of Oregon and The Reverend Alwyn E. Butcher, rector of St. Paul's church, to open by reciting the Apostle's Creed in the Tabernacle (which creed was renounced by Joseph Smith's first vision). 1930: On March 24, a citywide meeting was held at the Tabernacle to protest the Russian warfare against religion, among whom the participating ministers were Rt. Rev. Arthur W. Moulton, Bishop of the Episcopal diocese of Utah, the Rev. Arthur L. Rice, who represented the Salt Lake Ministerial Association and Pastor of Pillips, of the Congregational church. 1945: On September 4, a citywide celebration was held at the Tabernacle to give thanks for the ending of World War II. The speakers included Rev. A. W. Lyons, president of the Salt Lake Council of Religious Groups, Rt. Rev. Arthur W. Moulton, Episcopal bishop of Utah, and the benediction was by Rev. W. F. Bulkley, Episcopal archdeacon of Utah. 1946: On January 4, a celebration on Utah's fiftieth anniversary of statehood was held at the Tabernacle and two ministers were invited to the platform for the invocation, by a local Catholic Bishop, Duane G. Hunt, and the benediction by the Reverend Dr. John E. Carver, pastor of the First Presbyterian church of Ogden. 1991: On August 11 many Evangelical Christians who were members of the Gospel Music Workshop of America were permitted to use the Tabernacle for preaching and singing. Rev. Kenneth Ulmer and other ordained ministers participated in speaking and singing. 1996: On January 4, a citywide celebration was held at the Tabernacle to commemorate 100 years of statehood. Rev. Robert R. Sewell of the First United Methodist Church was one of the Tabernacle speakers. This whole incident is reminiscent of Johnson, when being informed that Ravi was the general editor of the new version of The Kingdom of the Cults, claimed that Ravi simply "agreed to lend his name to it, but he didn't write any of it" (cf. the Christianity Today article listed above). This appeared to be an effort to downplay Ravi's role in the book so that he would be able to speak in the tabernacle. Johnson ended up writing a letter of apology to Ravi over this. These instances are more examples of how the truth and attention to detail are being sacrificed. I have already written an article last November about my concerns with Standing Together's ministry approach, which seems to downplay the role of truth. The article may be found by clicking here. Ronald V, Huggins (associate professor of historical and theological studies at Salt Lake Theological Seminary) wrote the following essay that was published in the most recent issue of Journal of the Evangelical Theological Society (49.3--Sept. 2006, pp. 549-568): "LORENZO SNOW'S COUPLET: 'AS MAN NOW IS, GOD ONCE WAS; AS GOD NOW IS, MAN MAY BE'; 'NO FUNCTIONING PLACE IN PRESENT-DAY MORMON DOCTRINE?' A RESPONSE TO RICHARD MOUW". During his appearance with Ravi Zacharias in the Mormon Tabernacle on November 14, 2004, Fuller Seminary President Richard Mouw apologized on behalf of evangelicals for "bearing false witness" against Mormons. When challenged about his remarks, Mouw sent out an e-mail identifying places where he felt evangelicals had misrepresented Mormon teaching. Among these was the claim that "Mormonism teaches that God was once a human being like us, and we can become gods just like God is now," a belief, Mouw goes on to assure us, that has "no functioning place in present-day Mormon doctrine."